First thing to note is that you can change the dried fruit and nuts you use as you please. It's all about taste! So things like cherries, cranberries, apricots and walnuts can all easily be substituted (or even added) with the ingredients listed. 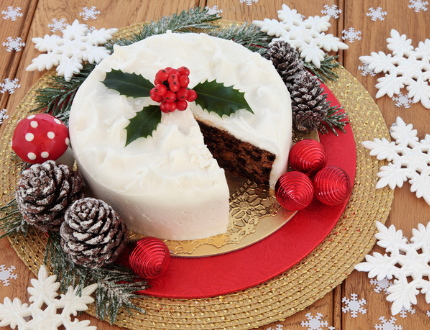 One of the biggest things that puts people off fruitcake is that they complain it is too dry. 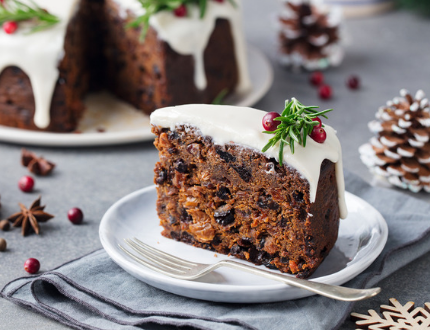 To help keep the cake moist, soak the dried fruit and peel in whisky preferably, although a liquid such as fruit juice also works. Cover the fruit and leave it to soak for 12 hours before you're planning on baking. Unfortunately, one of the issues when baking with dried fruit is that the cakes have a tendency to catch and become bitter. To resolve this and stop the outer layers of the cake from burning, simply grease and line a 20cm springform cake tin with two layers of baking paper. One you have greased and lined your tin, you want to heat your oven to 160C/325F/gas 2½. Cream your butter and sugar together until the texture becomes light and fluffy. Everyone has their own method for this, however, we recommend using electric beaters for at least 5 minutes to increase the volume of your mixture as much as possible. Add the eggs and beat well to avoid curdling. Get another large bowl to sift your flour into. Once the flour has been sifted, whisk the baking powder, your spices, almonds (nuts) and a pinch of salt into the bowl. NOTE: The spice can also be replaced with flavourings such as vanilla extract depending on taste, however, if you do decidee to go down this route then you may want to add less nutmeg and cardamon. Mix your dry ingredients, soaked fruits, lemon zest, ginger and almonds (or nut of your choosing) into the butter and sugar mixture. 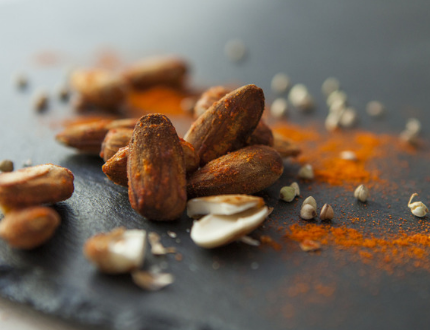 You can leave the almonds, nuts and ginger out if you prefer but it does help add to the flavour. Carefully tip your mixture into your pre-prepared tin and smoothen. You then should then make a small hole in the middle to help the cake rise properly whilst in the oven. Stick the cake in the oven for about an hour (best to keep an eye on it by checking the bake with a skewer every 10 minutes) then cover with foil and bake for 30 minutes more. You should be able to tell when the cake is ready as the skewer will come out sticky but not clotty. Once you have left the cake to cool in the tin, use your skewer to poke holes all over the top of the cake. Pour over a little more alcohol or fruit juice and allow to soak in. Once soaked in, tightly wrap the cake (whilst it's still in its greaseproof paper) in foil and leave it. Add more alcohol or juice every week or so until you're ready to ice (must recommend waiting at least 4 weeks). Add a splash of water and heat your jam until bubbling and then spread onto the top of the cake. Dust a surface with icing sugar to roll your marzipan out on. Make sure you roll the marzipan enough to cover the cake. Once you have done this, lift the marzipan over the cake then smooth down and trim the edges. Leave the cake to dry for a couple of days the brush again with either your whisky or cool boiled water. We then want to repeat this process again but with the ready-to-roll icing and... Vwala!! !